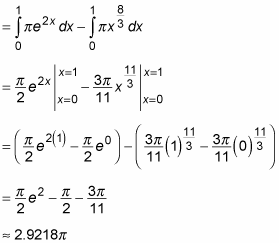 Find an expression that represents the area of a random cross section of the solid in terms of x. 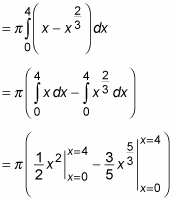 Use this expression to build a definite integral (in terms of dx) that represents the volume of the solid. 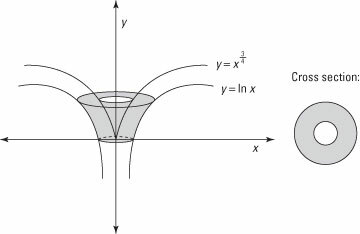 The trick is to find a way to describe the donut-shaped area of a cross section as the difference between two integrals: one integral that describes the whole shape minus another that describes the hole. For example, suppose that you want to find the volume of the solid shown here. A vase-shaped solid between two surfaces of revolution. 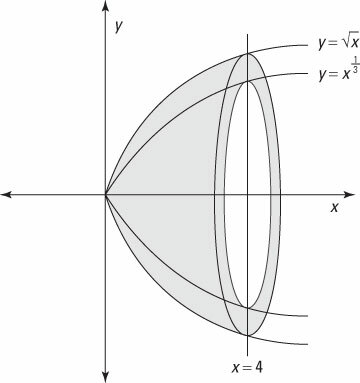 Find an expression that represents the area of a random cross section of the solid. Use this expression to build a definite integral that represents the volume of the solid. Here’s another problem: Find the volume of the solid shown here. Another solid formed between two surfaces of revolution. bounded below by y = 0 and above by y = 1. 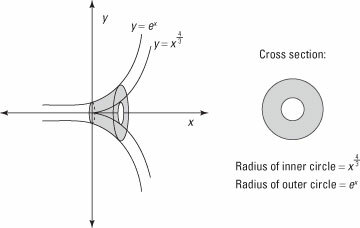 The cross section of this solid is shown on the right-hand side of the figure: a circle with a hole in the middle. The resulting problem is shown in this figure. Use inverses to rotate the problem from the earlier figure so you can use the meat-slicer method. So the volume of this solid is approximately 9.179 cubic units.